Jewers Doors’ Australian reseller, Max Doors Solutions (MDS), have recently completed the installation of four sets of Swift-SEW doors on the Maintenance Depot for the new Light Rail system in the country’s capital, Canberra. ​Suffolk Fire and Rescue Service commissioned Norwich-based Cooks Industrial Doors to replace failing vehicle access doors at Long Melford Fire Station in rural Suffolk. As a major reseller and installer, Cooks contacted Jewers Doors to design and manufacture state-of-the-art sliding-folding doors that would replicate the style of the original doors. ​Jewers Doors have recently installed eleven Osprey sliding-folding hangar doors at Solent Airport in Hampshire, which completes the latest step in a £50m masterplan to transform the Daedalus site in Fareham, near Portsmouth, into a business airport. NCHSR opened its doors to students in September 2017 following the installation of Jewers’ Swift-SEW high speed, automatic bi-folding doors which completed the external structure of the workshops at both Birmingham and Doncaster campuses. Jewers Doors have recently completed the installation of five of their Osprey sliding-folding doors to the new private aircraft hangarage and integral fire station at Old Warden Aerodrome in Bedfordshire. Jewers Doors, has installed eight of its latest Swift- SEW and two smaller Swift horizontal bi-folding doors at Transport for London (TfL)’s new Operations, Maintenance and Control (OMC) depot for the Elizabeth line at Old Oak Common, West London. Jewers Doors, has installed five of its latest Swift SEW automated sliding bi-folding doors at Hitachi Rail Europe’s (HRE) new £80m maintenance depot for the Intercity Express Programme (IEP) trains at Doncaster. Jewers Doors supplied and installed seven doors as part of the transformation of an old dilapidated dairy into a series of studios, workshops and galleries for internationally acclaimed artist and sculptor Sir Anish Kapoor. 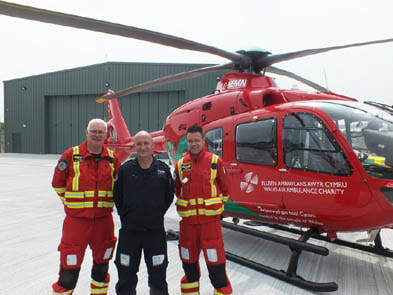 Wales Air Ambulance has installed an automatic, electrically operated, multi-leaf sliding folding Osprey hangar door to their new purpose-built helicopter hangar at Llanelli, Carmarthenshire. Specialist industrial door manufacturer Jewers Doors have installed two ‘thresholdless’ versions of their Kingfisher sliding door system in Boathouse 4 at Portsmouth’s Historic Dockyard. Jewers Doors were approached by Charles Mador Chartered Architects to design and supply a series of doors to secure the five teaching bays on the two-tier 60-bay driving range at Northwick Park Golf Club and Clubhouse. Jewers Doors put the finishing touches to the new £15 million Ambulance and Fire Services Resource Centre (AFSRC) at Wrexham with the installation of 14 pairs of Swift fast-acting, bi-fold doors. Hitachi Railway Systems have installed several Jewers Phoenix range sliding folding doors at their new UK flagship rolling stock manufacturing plant at Newton Aycliffe, Co Durham. London Fire Brigade chose Jewers Doors to design and manufacture 46 sets of fast acting exit doors for emergency vehicle bays at nine new Fires Stations as part of a £51 million refurbishment programme.